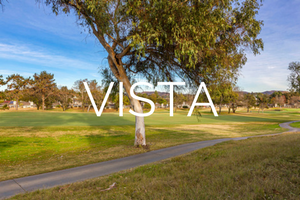 Located just seven miles inland from the Pacific Ocean in northern San Diego County, the City of Vista has a perfect mild Mediterranean climate. Residents enjoy a wide range of year-round outdoor activities in a setting of gentle rolling hills and pleasant rural surroundings. With more than 25 educational institutions for Vista youth, and a business park that is home to over 800 companies, it is no wonder that Vistawas listed as the seventh-best place in the United States for family life, based on factors such as jobs and business opportunities, education, climate, and cost-of-living in a 2008 review. Vista is approximately 19 square miles with a population of 96,122. Vista has a rich history and progressive future.